Interfaith honored volunteer Sam Dixon at North County Philanthropy Council’s 2016 Volunteer of the Year Awards, held at the Carlsbad Sheraton Resort on November 3rd. Sam has dedicated his life to service and ten years ago, he began volunteering at Interfaith. Every Friday morning, he makes and serves breakfast to the homeless and others in need. 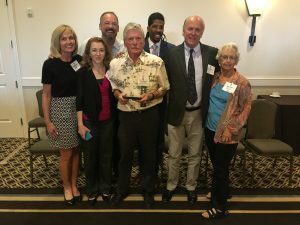 In addition, he volunteers as a Homeless Court Advocate, where he has touched countless lives by helping clients move forward in a positive direction, free from the burden of court fines. Present to join in the celebration (from left to right) was Board member Chris Schwan, Sam’s daughter Deborah Buckley, Paul Schwan, Board member Rev. Kadri Webb, Homeless Court Advocate Tom Christie, and Sam’s wife Ines Dixon. Thank you, Sam, for your years of service to the community!